CORAL GABLES, Fla. (Dec. 7, 2018) – Victor Lilov, who swept two prominent Boys 14 & under titles last winter but since has tested himself against older competition, moves back into his own division as the No.1 seed for next week’s Junior Orange Bowl International Tennis Championship. Lilov, from Raleigh, N.C., has not played a Boys 14s event since capturing the Les Petits As crown in France last January. One week earlier, he won the Junior International Teen Tennis showcase in England – becoming just the ninth player in 24 years to sweep both trophies in the same year. YaYi Yang of Chinese Taipei, the reigning WTA Future Stars champion, was given the top seed in the Girls 14s. Rudy Quan and Clervie Ngounoue, both ranked No.1 among the nation’s 12 & under talent, hold the top seeds in the younger divisions for the main draw that begins Dec. 12. The Junior Orange Bowl International received applications from more than 1,200 entrants, as top players from Europe, Asia and throughout the Americas set their calendars for South Florida. New champions will be crowned Dec. 18 at the University of Miami’s Neil Schiff Tennis Center. A qualifying event will be played Dec. 9-11 to fill out the brackets. The final field is expected to boast players from some 40 U.S. states and 75 nations from around the globe. Lilov’s last loss in the Boys 14s came at last year’s Junior Orange Bowl, when he bowed out in the round of 32. From there, he regrouped in the new year to win five matches at the Junior International Teen and six at Les Petits As. He became the fourth American to complete the double, last accomplished by CiCi Bellis in 2013 and Francis Tiafoe the previous year. Since then, he has focused on playing older competition, reaching the quarterfinals of the Boys 18s at last month’s Evert American ITF event and the Round of 16 in Boys 16s at July’s USTA National Clay Courts in Delray Beach, Fla.
John Kim (Sunnyvale, Calif.), who actually holds the nation’s No.1 ranking among Boys 14s, heads a list of challengers that features 13 of the USTA’s top 15. The draw also includes No.1s from Europe (Croatia’s Mili Poljicak), South America (Paraguay’s Adolfe Daniel Vallejo) and Japan (Seika Nishima). Yang captured the WTA Future Stars crown with a straight-sets victory over Japan’s Mio Kozaki, who will be angling for a rematch in South Florida. Yang also has spent all year taking on older competition, winning twice in Asia over the summer. Eleana Yu (Mason, Ohio), ranked No.1 among U.S. Girls 14s, is among 10 of the top 20 in the nation coming to South Florida. The field also includes South America’s No.1 Gabriela Cortes Flores (Bolivia) and No.2 Solana Sierra (Argentina), plus Japan’s top-ranked Kyoka Kubo. Ngounoue, from Washington, D.C., is another player stepping back to her natural age bracket at the Junior Orange Bowl. She won the Girls 14s at the National Clay Courts and has lost just twice since, including the Girls 14s final of the recent Eddie Herr International in Bradenton, Fla.
Top Girls 12s challengers also include Russia’s Ekaterina Ivanova, Canada’s Anastasia Kavounov and Brooklyn Olson of Bradenton. Quan, of Sacramento, Calif., is unbeaten in Boys 12s competition over the past 12 months, going 33-0 that includes winning the National Clay Courts. His only loss of 2018 came at the Boys 16s level, falling in the final of the SoCal Junior Championships. Alexander Razeghi (Humble, Texas) heads the list of challengers in the Boys 12s, joined by China’s Jinpeng Tang, France’s Leo Cohen Bacrie and Argentina’s Lucca Guercio. Each division will be contested at a different locale – Crandon Park Tennis Center (Boys 14s), Schiff Tennis Center (Girls 14s), Salvadore Tennis Center (Boys 12s) and William H. Kerdyk Biltmore Tennis Center (Girls 12s). UM will host all finals Dec. 18 except for the Boys 12s, which will remain on Salvadore’s clay. The Junior Orange Bowl International Tennis Championship has a rich history of bringing the world’s most promising young tennis players to Coral Gables. Its list of champions who later won Grand Slam titles includes two-time Wimbledon champion Andy Murray (Boys 12s, 1999) and 2009 U.S. Open winner Juan Martin del Potro (Boys 14s, 2002). 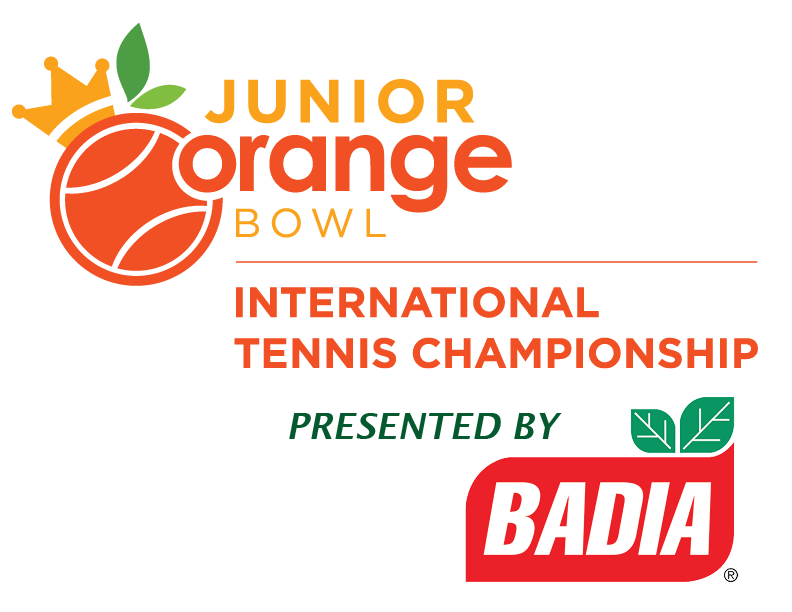 Badia Spices Inc. again serves as presenting sponsor of the Junior Orange Bowl International Tennis Championship. FILA serves as the official apparel and footwear provider and Wilson supplies the official tournament ball.